Our report describes a unique method to visualize and analyze CTC/EC interactions in prostate cancer under physiological flow conditions. Gakhar, G., Bander, N. H., Nanus, D. M. In vitro Method to Observe E-selectin-mediated Interactions Between Prostate Circulating Tumor Cells Derived From Patients and Human Endothelial Cells. J. Vis. Exp. (87), e51468, doi:10.3791/51468 (2014). Metastasis is a process in which tumor cells shed from the primary tumor intravasate blood vascular and lymphatic system, thereby, gaining access to extravasate and form a secondary niche. The extravasation of tumor cells from the blood vascular system can be studied using endothelial cells (ECs) and tumor cells obtained from different cell lines. Initial studies were conducted using static conditions but it has been well documented that ECs behave differently under physiological flow conditions. Therefore, different flow chamber assemblies are currently being used to studying cancer cell interactions with ECs. Current flow chamber assemblies offer reproducible results using either different cell lines or fluid at different shear stress conditions. However, to observe and study interactions with rare cells such as circulating tumor cells (CTCs), certain changes are required to be made to the conventional flow chamber assembly. CTCs are a rare cell population among millions of blood cells. Consequently, it is difficult to obtain a pure population of CTCs. Contamination of CTCs with different types of cells normally found in the circulation is inevitable using present enrichment or depletion techniques. In the present report, we describe a unique method to fluorescently label circulating prostate cancer cells and study their interactions with ECs in a self-assembled flow chamber system. This technique can be further applied to observe interactions between prostate CTCs and any protein of interest. Metastasis is a complex multi-step process that remains poorly understood. The E-selectin/selectin ligand axis has been shown to play an important role in tumor metastasis by promoting primary adhesive interactions between the vascular endothelium and cancer cells1,2. Endothelial (E)-selectin is a transmembrane protein expressed by activated endothelial cells, while different E-selectin ligand(s) are expressed by tumor cells3. Numerous in vitro approaches have been successfully employed to model E-selectin/selectin ligand interactions between tumor cells and endothelial cells (ECs)1. To study these interactions, different flow chamber systems are being employed to simulate blood vascular system. Among flow chamber assemblies, parallel-plate flow chamber (PPFC) in conjunction with ECs is routinely used as an in vitro model simulating in vivo shear stress conditions. In this method, ECs are grown on a 35-mm dish and after achieving a monolayer, ECs are attached to the PPFC and shear stress based experiments are performed. However, PPFC and other current systems present many limitations to studying adhesive interactions between circulating tumor cells (CTCs) derived from patients and ECs, primarily, because CTCs are a rare population of cells, shed from the primary tumor, circulating among millions of blood cells (1 CTC per 109 blood cells)4. Hence, unlike unlimited supply of cultured cell lines, low CTC counts lead to very few and rare CTC/EC interactions, requiring proper flow channel width to record the interactions for playback analysis. Additionally, since patient derived CTCs are an impure population, therefore an identification marker is required to track CTCs in specific. To solve this problem, we developed a new method to identify prostate cancer (PCa) CTCs by taking advantage of the fact that virtually all of these CTCs express prostate specific membrane antigen (PSMA) on their cell surface5,6. In this report, we used the prostate cancer cell line, MDA PCa2b (MDA), to demonstrate the potential utility of our new system to study prostate CTC interactions with ECs, eventually to understand the mechanism of metastasis. Our methodology can be applied for various shear based experiments simulating in vivo vascular system7-9. Besides examining PCa CTC/EC interactions, the current flow chamber system could be easily adapted for analyzing peripheral blood mononuclear cells or tumor cells’ interactions with ECs. The ease of disassembling and reassembling of the flow chamber, a microslide III (0.1) (hereafter referred as microslide), allows culturing ECs under perfusion and stimulating ECs with different cytokines to induce protein expression. Besides, cultured ECs, recombinant proteins such as E- and P-selectin can be coated onto the microslide and interactions with tumor cells can be observed under laminar flow conditions10. Under the tissue culture hood, first rinse the microslide, channel width of 1 mm with PBS. Gently coat the microslide with 200 µl of 50 µg/ml fibronectin (dissolved in PBS) using a 1-ml Luer-lock syringe. Cover the microslide with the lid and keep it inside the tissue culture hood for 30 min. Slow dispensing of the liquid in the microslide prevents bubble formation in the channel. Perfuse 200 µl of warm (37 °C) HUVEC growth medium (M199 media, 1M HEPES, 20% FBS, 5 mg/ml heparin, 100 µg/ml endothelial cell growth factor, and L-glutamine) over the microslide and incubate for 20 min at RT. During the perfusion, prepare HUVEC cell suspension. Rinse HUVECs with PBS and add 0.05% trypsin-EDTA for 1-2 min at RT. Centrifuge HUVECs in 2 ml growth medium at 180 x g for 5 min. Measure the cell concentration using a neubauer hemocytometer and prepare 107 HUVEC cells/100 µl growth medium. 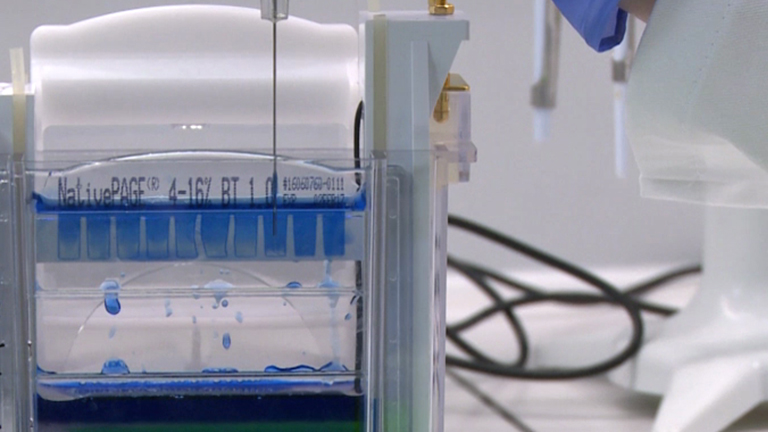 Then, carefully remove the medium from the inlet of the microslide using a 200-µl pipette tip. Bring the microslide to eye level and using a 1-ml Luer-lock syringe, gently perfuse 200 µl of prepared concentration of HUVECs into the channel. Caution is required at this step to prevent bubble formation. If the bubbles appear, keep perfusing for a slightly longer time until bubbles enter the outlet channel. Put an equal volume (~80 µl) of HUVEC media in both the inlet and outlet of the microslide. This prevents the flow of cells in either direction. Cover the slide and keep it in the incubator (37 °C) for 1.5 hr. Place a sterile 20-ml syringe, female and male Luer connectors, tubing, and a syringe pump in the incubator for 15 min. For minimal dead volume, use the tubing with inner diameter of 0.04 inches. Smaller tubing diameter prevents bubble formation. Fill the 20-ml syringe with warm (37 °C) HUVEC media (12 ml). Attach the tubing with the connectors onto the syringe. Remove the bubbles. Connect this assembly to the microslide. Completely fill the inlet of the microslide with HUVEC media. Bring the filled 20-ml syringe attached to the connector next to the microslide. Gently attach the connector to the microslide. Bring the set-up into the incubator and connect it to the syringe pump, set at 10 µl/min shear rate. Leave the cells O/N in the incubator at 37 °C. Next day, disassemble the set-up by removing the connector attached to the inlet of the microslide. To upregulate E-selectin expression on ECs, prepare fresh growth medium containing IL-1β at 10 ng/ml in 4 ml media. Aspirate the media in a 10-ml syringe. Remove the media from the inlet of the microslide and connect the syringe to the slide. Set the syringe pump at 10 µl/min shear rate for 4 hr in the incubator. During IL-1β incubation of HUVECs, prepare anti-PSMA J591-alexa488 labeled PCa cells. Add 0.05% trypsin-EDTA to MDA cells for 1 min. Do not expose the cells to trypsin for longer times as it can affect the glycopeptides present on the cell surface. Enzyme free cell dissociation reagent can also be used instead of trypsin. Centrifuge at 200 x g for 5 min. Resuspend MDA cell pellet in 1 ml H/H buffer (Hanks balanced salt solution/0.1% HSA/10 mM HEPES/1 mM CaCl2). Add anti-PSMA J591-alexa488 antibody at 20 µg/ml for 30 min at RT in a dark place. Resuspend the cells during the incubation. After 30 min, centrifuge the cell solution at 800 x g for 5 min. Aspirate and resuspend the pellet in 1 ml H/H buffer. Count the labeled MDA cells and bring the final concentration to 1x106 cells/ml. Fill a 5-ml syringe with J591-488 labeled MDA cells and remove the bubbles. Collect 7.5 ml blood from prostate cancer patients in a blue cap tube (containing sodium citrate). Gently dilute blood 1:1 in 0.1% BSA/1 mM EDTA/PBS. Add 5.3 ml Ficoll-paque plus in a 50-ml conical tube. Layer diluted blood on top of the ficoll-paque. Centrifuge at 400 x g for 30 min. Pre-coat all the tubes or tips coming in contact with CTCs with 2% FBS/RPMI-1640/ 1 mM CaCl2/ 4 mM MgCl2 (R/S buffer) to prevent non-specific binding of CTCs to the surfaces. Maintain 4 °C temperature of media and buffers coming in contact with CTCs. Collect the peripheral blood mononuclear cell (PBMCs) fraction containing CTCs from the interface in another 50-ml conical tube containing 30 ml R/S buffer. Centrifuge at 400 x g for 8 min. Resuspend the pellet and wash again in R/S buffer at 400 x g for 8 min. After centrifugation, resuspend the pellet in H/H buffer. Add anti-PSMA J591-488 antibody at 20 µg/ml for 30 min at RT in a dark place. After 30 min, centrifuge the PBMCs containing J591-488 labeled CTCs at 800 x g for 5 min. Resuspend in H/H buffer. Fill a 1-ml syringe (pre-coated with R/S buffer) with the sample. Turn on the inverted microscope and set the Kohler illumination at 10X objective. Bring the syringe pump at the same level as the sample stage of the microscope and set it at 1 dyn/cm2 shear stress (~ 10 µl/min). Open the Zeiss Axiovision software. Select the objective on the computer screen. Create a new folder under the tools option in the software. Open the smart experiments option in Axiovision and adjust the settings to record short 30 sec videos for 30 min. For live fluorescent video, set the image options- 12 msec Exposure, 2 x 2 bin, 5 Gain. These parameters help in attaining videos close to the video frame rate (~ 23 frames per sec) with the Zeiss mRm camera. To visualize full width of the flow channel at 10 X objective on the computer screen, use a C-mount adapter (0.63 x f/60 mm Interface). Switch on the mercury lamp. Place the syringe and the connector containing the cells onto the syringe pump. Bring IL-1β stimulated HUVECs from the incubator. Attach the connector to the filled inlet channel of the microslide containing HUVECs. Connect the outlet channel with the connector attached to the tubing. Put the tubing into a dish or 15 ml conical tube to collect the flow through. Start the infusion through the microslide at 10 µl/min. Observe the interactions between endothelial cells and labeled MDA cells or labeled CTCs derived from patients under 488-nm filter on the epifluorescence microscope. Start recording the experiment as 30 sec short videos. During playback analysis, measure the rolling velocity. Rolling velocity is measured by dividing the distance traveled by the cells over time. Remove the media from the inlet and outlet of the microslide after perfusing MDA cells on IL-1β-stimulated HUVECs for 10 min. Using a 200-µl tip, put warm (37 °C) PBS containing calcium and magnesium into the inlet of the microslide for 5 min. Tilt the microslide using its lid as a prop on the bench. Keep the microslide in a tilted position for all the incubations during immunostaining. Incubate for 20 min at RT. Rinse twice with PBS for 5 min each. Add triton-X 100 (0.1%) in 5% BSA in PBS for 10 min at RT. Rinse twice with PBS for 5 min each. Block with 5% BSA in PBS for 30 min. Incubate with primary antibody goat anti-VE-Cadherin (1:100) in 2.5% BSA O/N at 4 °C. Next day, wash twice with PBS for 5 min each. Add secondary donkey anti-goat 647 antibody for 45 min. Wash twice with PBS for 5 min each. Incubate at RT with humanized J591-alexa488 conjugated antibody for 1 hr. Wash twice with PBS for 5 min each. Add DAPI for 5 min. Wash with distilled water for 5 min. Add PBS (or mowiol for long-term storage). Visualize the microslide under the confocal microscope. Figure 1 shows an O/N culture of a monolayer of ECs on the microslide. The scalings on Figure 1A shows that 100% of the microslide is visible using 5X objective while 70% is visible using a 10X objective (Figure 1B). For E-selectin mediated interactions, cells rolling at the edges are not considered which makes more than 70% of the microslide available for video-recording and playback analysis. In our experience, initially this set-up assembly needs some practice to culture a monolayer of ECs under shear stress. After establishing EC growth on the microslide, we labeled MDA, prostate cancer cells. 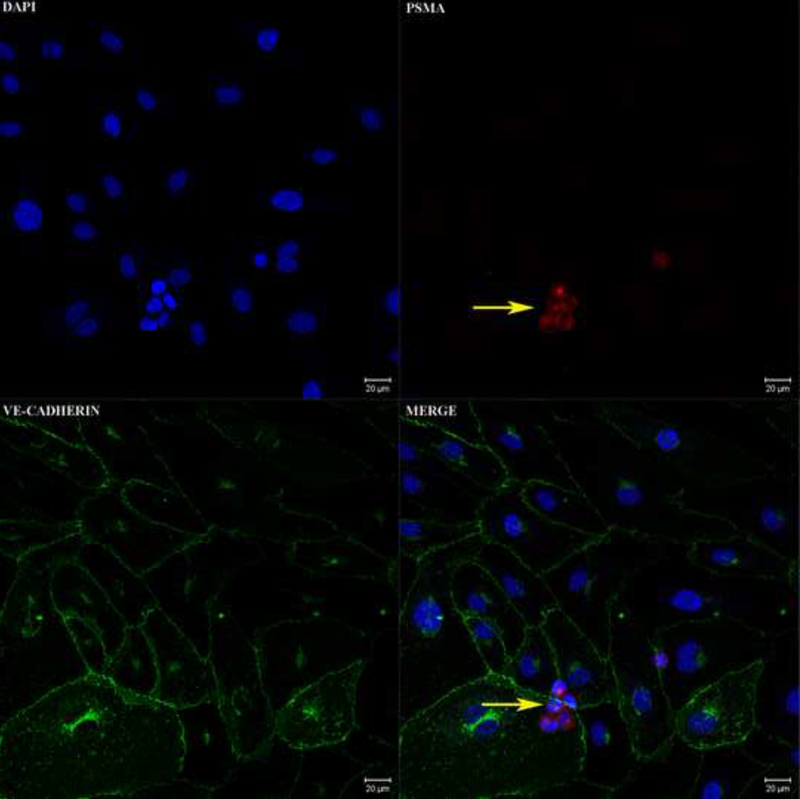 The specificity of J591-488 anti-PSMA antibody was tested using MDA cells spiked in healthy donor blood and labeled with fluorescently labeled anti-PSMA J591-488 monoclonal antibody. No PSMA immunostaining was observed in PBMCs (data not shown). To rule out the possibility that J591-488 binding and internalization alters rolling behavior, we labeled MDA cells with J591-488 and compared the rolling behavior with unlabeled MDA cells at shear stresses ranging from 1-10 dyn/cm2. The box plot shows the distribution of the rolling velocities of both unlabeled and J591-488-labeled MDA cells on IL-1β-stimulated ECs at different shear stress conditions. No significant difference was observed in the rolling velocities at 1 and 5 dyn/cm2, p=0.634 and p=0.601, respectively (Figure 2). 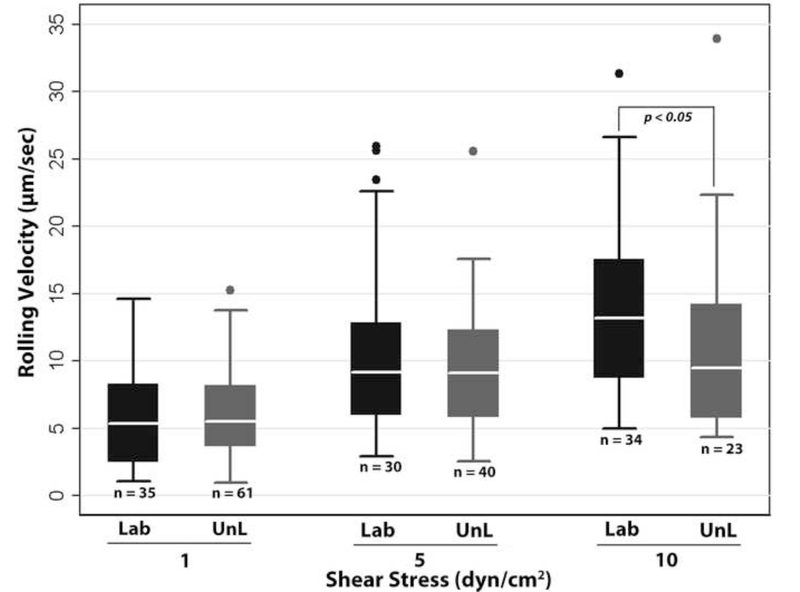 At higher shear stress of 10 dyn/cm2, a statistically significant difference was observed between the rolling velocities of unlabeled and J591-488-labeled MDA cells (p<0.05). Previous studies show that at higher shear stress (> 3 dyn/cm2) conditions, fewer tumor cells adhere and roll on ECs compared to lower shear stress conditions11,12. Therefore, studies analyzing interactions between tumor cells and ECs are conducted at lower shear stresses. Thus, our data suggests that CTCs can be labeled with J591-488 and that fluorescent labeling of CTCs does not significantly affect the rolling behavior at a wide range of shear stress. Of note, we did not detect any CTC/EC interactions in the absence of IL-1β stimulation of ECs (data not shown). In addition, as a proof of principle, we also labeled enriched CTCs isolated from CRPC patients with J591-488 and perfused over IL-1β-stimulated ECs. A time-stitched video shows the different types of interactions between prostate CTCs and ECs (Video 1). The video shows three types of interactions- stable adhesion (CTCs did not detach even after 30 sec), tethering (CTCs attach and reattach), and no interactions. Microslides can be easily immunostained and fluorescent images can be taken because the microslides have similar optical characteristics as a 1.5-mm thick coverglass7. Figure 3 shows the firm adhesion of J591-488 labeled MDA cells after perfusion over IL-1β-stimulated ECs. Figure 1: A monolayer of endothelial cells cultured on the microslide. HUVECs were cultured O/N on a fibronectin (50 µg/ml) coated microslide III (0.1) under shear stress (1 dyn/cm2). A) At 5X objective (EC Plan Neofluar 5X/0.16), complete flow channel width with cultured ECs was observed. The width of the channel was measured to be 1,545.95 µm. B) At 10X objective (Plan Neofluar 10X/0.3 Ph1), 1,065.79 µm of the channel was observed. This suggests that ECs can be cultured O/N on the microslide and 70% of the microslide is visible at 10X magnification. Please click here to view a larger version of this figure. Figure 2. Rolling velocity of MDA cells on ECs cultured on the microslide. One million unlabeled and J591-488 labeled MDA cells were perfused over IL-1β-stimulated HUVECs. Ten videos at different fields on the microslide were recorded at 1,5, and 10 dyn/cm2. Shear stress calculations were provided by the manufacturer. Offline analysis for the rolling velocity was performed. n=number of cells counted for the rolling velocity measurements. Box plot shows the distribution of the rolling velocities and median differences between J591-488 labeled and unlabeled MDA cells. p< 0.05, Wilcoxon rank sum test. The circles represent the outliers. Please click here to view a larger version of this figure. Figure 3. Immunostaining of MDA cells interacting with ECs on the microslide. One million MDA cells were perfused over IL-1β-stimulated HUVECs at 1 dyn/cm2 shear stress. After perfusion, immunostaining was performed on the microslide. The yellow arrowheads show MDA cells firmly adhered to the ECs. PSMA=Red, VE-Cadherin=Green, DAPI=Blue. The merged image shows all the colors. Please click here to view a larger version of this figure. Video 1. A video showing the interactions between IL-1β-stimulated HUVECs and anti-PSMA J591-488-labeled CTCs enriched from a prostate cancer patient. A monolayer of HUVECs was cultured on the microslide III (0.1) and anti-PSMA J591-488-labeled peripheral blood mononuclear cells (PBMCs) containing CTCs enriched from a patient was perfused on HUVECs at 1 dyn/cm2. During the perfusion, short 30 sec videos were recorded, at different fields on the microslide. The acquisition time of the video is shown on the bottom left corner. Different short videos were stitched together to compile this video. At 2:16:36, a non-interacting CTC enters the upper left field of view; at 2:19:16, another non-interacting CTC enters the left corner field of view; at 2:23:12, a stably adhered CTC in the top middle field of view is seen. At 2:38:09, a stably adhered CTC is seen on the right side of the field of view is seen. This video was taken using both bright-field and fluorescent channel to show the interactions of PBMCs as well. At 2:40:18, stably adhered CTCs were observed in the top middle field of view. This video was taken using bright-field and fluorescent channel to show the rolling behavior in PBMCs. From 2:51:39 through 2:51:49, a CTC exhibiting tethering behavior was observed in the bottom field of view. Click here to view video. Due to the low number of CTCs among blood cells, it is difficult to isolate CTCs as a pure population of cells. In order to study CTC/EC interactions, the rare and impure population of CTCs poses two major challenges: a) Identification of CTCs among blood cells; b) Observation of CTC/EC interactions. To overcome the first limitation of identifying prostate CTCs among blood cells, we took advantage of the fact that virtually all prostate tumor cells express PSMA6. Monoclonal antibody J591-488 is internalized following cell-surface binding suggesting that PCa CTCs can be labeled ex vivo and studied for CTC/EC interactions13. For optimal internalization of the antibody and maximal immunofluorescence, we incubated MDA cells with the antibody at either 4 °C or 37 °C for either 30 min or 1 hr. We observed that maximum immunofluorescence was observed at 37 °C for 30 min (data not shown) and immunofluorescent labeling of prostate cells did not affect the rolling behavior compared with unlabeled prostate cells. To overcome the second limitation, we tested different flow chamber assemblies such as PPFC, Bioflux microfluidics system, and Microslides7. The PPFC has become a mainstay to examine leukocyte and tumor cell interactions with ECs under physiologic flow conditions9. This flow system works well to study interactions of large number of cells such as cancer cell lines, but not ideal to observe and study the interactions between rare cells such as patient-derived CTCs and ECs. CTCs, being rare cells, can interact with ECs randomly at any location in the flow channel, therefore, recording of the full width of the flow channel is required to observe and analyze the rare event interactions between CTCs/ECs during playback analysis. The width of the silastic gasket used in the PPFC (2.5 mm) does not provide a full field of view under 10x objective. While, at a lower magnification than 10X objective, it becomes difficult to clearly observe CTC/EC interactions. In addition, low dead volume in the connecting tubes is essential to avoid trapping of CTCs in the connecting tubes. The silastic connecting tubes provided with the standard PPFC have a wide inner diameter (0.16 in.). On the contrary, Bioflux microfluidics system provides full field of view under 20X objective and is useful in studying shear-induced changes in the ECs14, however, cancer cells start settling down in the chamber wells leading to non-uniform flow. Bioflux microfluidics is useful in studying shear-induced changes in the ECs, however, it is technically cumbersome to use. Our self-assembled flow chamber using microslide has a narrow channel width (1 mm) than the standard channel width in PPFC, allowing more observational area. Also, ECs are cultured under perfusion in microslide simulating physiologic blood flow, unlike Ganguly et al.7, studies where ECs are grown on microslides (with wider channel width) in static conditions. The dead volume inside the connecting tubes is decreased by using a connecting tube with inner diameter of 0.02 in. Collectively, immunofluorescent labeling of prostate tumor cells, proper flow channel width, and smaller inner diameter of the connecting tubes allows one to identify prostate CTCs and observe their interactions with ECs. There are few critical steps in the protocol, however, with proper care the experiments can run smoothly. Prevention of bubbles is crucial for any flow-based experiments. In our experience, using warm (37 °C) growth medium, connectors, and syringe prevents the formation of bubbles by reducing the temperature differences. In addition, care should be taken while connecting the syringe with the microslide. Both the connector attached to the syringe and the inlet of the microslide should be filled to the brim, thereby, preventing any bubble formation. One of the limitations of the technique is that since the microslide channel is 45 x 1 mm (length x width), it can only hold 4.5 µl of growth medium. Therefore, microslide cannot be used for static culture and requires continuous perfusion of growth medium to prevent acidification and maintaining proper supply of nutrients for HUVECs. However, continuous supply of medium can be easily achieved by using a syringe pump connected to the microslide in the incubator. While enriching CTCs from prostate cancer patients, care should be taken to pre-coat all the tubes, tips, pipettes, and syringes coming in contact with CTCs with R/S buffer to prevent non-specific binding. In addition, all the steps after ficoll-paque density centrifugation, except J591-488 antibody incubation, should be conducted at 4 °C to prevent the degradation of CTCs. Our technique is unique in comparison to different methods understanding CTC biology. The present report describes viable fluorescent immunolabeling of prostate CTCs which allows one to observe the functional characteristics of prostate CTCs, besides just the phenotypic properties. In addition, the described method requires low sample/reagent volume than other methods making it an ideal system for immunofluorescence studies. Our methodology provides a unique platform to study interactions between prostate CTCs derived from patients and ECs, thus, helping to understand the mechanisms involved in the development of prostate cancer metastases. This technique has the potential for multiple applications involving shear flow based studies, such as cell-cell interactions8, cell-protein interactions15, transmigration16, and shear-induced changes in ECs14. Dr. Bander is the inventor on patents that are assigned to Cornell Research Foundation ("CRF") for the J591 antibody used in this article. Dr. Bander is a consultant to and owns stock in BZL Biologics, the company to which the patents have been licensed by CRF for further research and development. This work was supported by funding from Department of Defense-Prostate Cancer Research Program (W81XWH-12-1-0124), U54CA143876 from the National Cancer Institute, and the Robert McCooey Genitourinary Oncology Research Fund. We would like to thank Dr. Annarita Lorenzo (Department of Pathology) for providing VE-Cadherin antibodies, and Dr. Marco Seandel (Department of Surgery) for providing HUVECs. Dimitroff, C. J., Lechpammer, M., Long-Woodward, D., Kutok, J. L. Rolling of human bone-metastatic prostate tumor cells on human bone marrow endothelium under shear flow is mediated by E-selectin. Cancer Res. 64, 5261-5269 (2004). Barthel, S. R., Gavino, J. D., Descheny, L., Dimitroff, C. J. Targeting selectins and selectin ligands in inflammation and cancer. Expert Opin. Ther. Targets. 11, 1473-1491 (2007). Konstantopoulos, K., Thomas, S. N. Cancer cells in transit: the vascular interactions of tumor cells. Annu. Rev. Biomed. Eng. 11, 177-202 (2009). Nagrath, S., Sequist, L. V., Maheswaran, S., Bell, D. W., Irimia, D., Ulkus, L., et al. Isolation of rare circulating tumour cells in cancer patients by microchip technology. Nature. 450, (7173), 1235-1239 (2007). Mannweiler, S., Amersdorfer, P., Trajanoski, S., Terrett, J. A., King, D., Mehes, G. Heterogeneity of prostate-specific membrane antigen (PSMA) expression in prostate carcinoma with distant metastasis. Pathol. Oncol. Res. 15, (2), 167-172 (2009). Tagawa, S. T., Milowsky, M. I., Morris, M. J., Vallabhajosula, S., Christos, P. J., Akhtar, N. H., et al. Phase II study of lutetium-177 labeled anti-prostate-specific membrane antigen (PSMA) monoclonal antibody J591 for metastatic castration-resistant prostate cancer. Cancer Res. (2013). Ganguly, A., Zhang, H., Sharma, R., Parsons, S., Patel, K. D. Isolation of human umbilical vein endothelial cells and their use in the study of neutrophil transmigration under flow conditions. J. Vis. Exp. (66), 10-3791 (2012). Moss, M. A., Zimmer, S., Anderson, K. W. Role of metastatic potential in the adhesion of human breast cancer cells to endothelial monolayers. Anticancer Res. 20, 1425-1433 (2000). Wiese, G., Barthel, S. R., Dimitroff, C. J. Analysis of physiologic E-selectin-mediated leukocyte rolling on microvascular endothelium. J Vis Exp. 24, (2009). Gebauer, F., Wicklein, D., Stubke, K., Nehmann, N., Schmidt, A., Salamon, J., et al. Selectin binding is essential for peritoneal carcinomatosis in a xenograft model of human pancreatic adenocarcinoma in pfp--/rag2-- mice. Gut. 62, (5), 741-750 (2013). Giavazzi, R., Foppolo, M., Dossi, R., Remuzzi, A. Rolling and adhesion of human tumor cells on vascular endothelium under physiological flow conditions. J. Clin. Invest. 92, (6), 3038-3044 (1993). Remuzzi, A., Giavazzi, R. Adhesion of tumor cells under flow. Adhesion Protein Protocols. Dejana, E., Corada, M. 96, Humana Press. 153-157 (1999). Liu, H., Moy, P., Kim, S., Xia, Y., Rajasekaran, A., Navarro, V., et al. Monoclonal antibodies to the extracellular domain of prostate-specific membrane antigen also react with tumor vascular endothelium. Cancer Res. 57, (17), 3629-3634 (1997). Jung, B., Obinata, H., Galvani, S., Mendelson, K., Ding, B. S., Skoura, A., et al. Flow-regulated endothelial S1P receptor-1 signaling sustains vascular development. Dev. Cell. 23, (3), 600-610 (2012). Yin, X., Rana, K., Ponmudi, V., King, M. R. Knockdown of fucosyltransferase III disrupts the adhesion of circulating cancer cells to E-selectin without affecting hematopoietic cell adhesion. Carbohydr. Res. 345, (16), 2334-2342 (2010). Carman, C. V., Springer, T. A. A transmigratory cup in leukocyte diapedesis both through individual vascular endothelial cells and between them. J Cell Bio. 167, (2), 377-388 (2004).